Mary Jo Jerde, MBA, BSN, RN, FAAN, senior vice president, Center for Clinician Advancement, UHG; Norma Poll-Hunter, PhD, the AAMC’s senior director, human capital portfolio; and Tim Dall, executive director, Life Sciences Consulting, IHS Markit. With the United States projected to face a significant physician shortage by 2030, new medical schools are opening, existing schools are increasing enrollment, and academic medical centers are implementing innovative plans to help all patients have access to the doctors they need. But, as the academic medicine community works on a multipronged approach to combat this impending shortage, all stakeholders must also ensure that our physician workforce reflects the growing diversity of our nation. 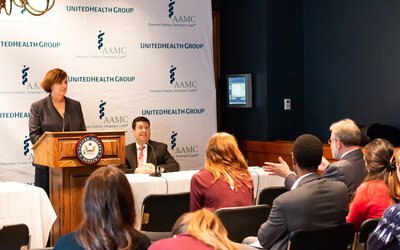 A November Capitol Hill briefing hosted by the AAMC and UnitedHealth Group (UHG) highlighted the work being done by academic medicine and managed health care to promote an inclusive and culturally competent health and biomedical workforce. Speakers were Tim Dall, executive director, Life Sciences Consulting, IHS Markit; Mary Jo Jerde, MBA, BSN, RN, FAAN, senior vice president, Center for Clinician Advancement, UnitedHealth Group; and Norma Poll-Hunter, PhD, senior director, human capital portfolio, AAMC. The briefing was moderated by Karen Fisher, JD, chief public policy officer, AAMC. That immediate projected need and ensuring that the 21st century physician workforce is capable of treating patients from all backgrounds is an issue UHG is also working to address. “What keeps me up at night is the workforce, specifically, how we can invest in the workforce today,” Jerde said. UHG, through its Diverse Scholars Intiative managed by the United Health Foundation, has made inroads in workforce diversity by awarding 2,100 scholarships since 2007 to aspiring primary care providers, predominately in underserved communities — totaling $16 million in assistance. This program allows primary care providers to return to their communities and serve them where it is most needed, allowing them to come full circle. This does not only result in more fulfilled and empathetic physicians, it yields diversity dividends. Research shows that women, racial and ethnic minorities, and individuals from rural and poorer socioeconomic backgrounds are more likely to practice in underserved communities, and right now individuals from these backgrounds are not enrolling in medical schools at the rate that is needed to address projected shortfalls. Poll-Hunter described one successful pipeline program, the Robert Wood Johnson Foundation Summer Health Professions Education Program (SHPEP). SHPEP successfully recruits students from economically disadvantaged communities and ethnic and racial minorities. An impact study focused on earlier cohorts showed program participants were 8 percentage points more likely to apply to medical or dental school and 10 percentage points more likely to matriculate than nonparticipants. Since 1989, more than 7,000 of the program’s participants have become physicians. In addition to its pipeline efforts, the UHG Foundation also makes grants to institutions to develop new teaching and training models that prepare physicians for work in the ever-changing health care industry. A recent grant to the University of Nevada, Las Vegas School of Medicine helped institute the Longitudinal Integrated Clerkship (LIC) model at the school. As part of the LIC model, students follow a set of patients throughout their care, rather than seeing different patients during each clinical rotation. This allows the students to experience different specialties while also creating a sense of the grand scope of health care and an understanding of the whole health of the patient. Fisher also made a call for federal support for pipeline programs, including those funded by Titles VII and VIII of the Public Health Act. These programs build social capital in underserved and racial and ethnic minority communities, increase academic enrichment, and provide exposure to clinical experiences and research. While increasing the number and diversity of future health care providers will help address the overall physician shortage, it also will be impacted by those already in the workforce. As Dall noted, the retirement ages of current physicians and the workloads and use of advanced practice nurses and physician’s assistants will affect the supply of physicians. The 1997 cap on Medicare support for graduate medical education has also stymied the necessary commensurate increases in residency training, creating a bottleneck for the physician workforce. The AAMC monitors these trends as part of its workforce analysis and a new set of projections, incorporating this analysis, is expected in the spring of 2019. Through its Center for Clinician Advancement, UHG is working to ensure today’s health care providers are able to adapt to changes in the industry. Through the center, UHG develops providers who are trained in interprofessional collaboration and the business of health care and can advocate for their practice at the state and federal level. “We have created a community of clinicians by fostering their learning and development, and it only helps them enhance their day-to-day practice and be their best,” Jerde said. 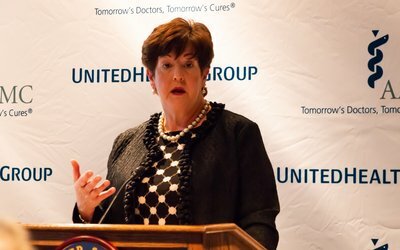 The briefing underscored that critical role of partnerships amongst the federal government, academic medicine community, and industry in preparing for the health care workforce of the 21st century.